Walker, William Sterling. 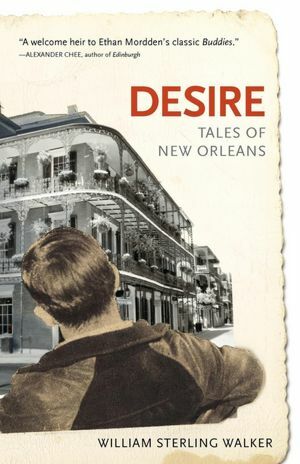 “Desire: Tales of New Orleans”, Chelsea Station Editions, 2012. Let me start this review with this note—I was born, raised and educated in New Orleans and wherever I may live New Orleans will always be home. Also I tend to be more critical of people who write about the city I will always love— but relax, William, this is going to be a rave review. Jameson Currier and his Chelsea Editions seem to know me very well. The last book I reviewed from that was about a gay Jew dealing with his sexuality and then a week later along comes a book about my hometown. I read “Desire” hanging onto every word and reading twice and three times the descriptions in the book. It made me homesick and I think that is probably because I was somewhat active in both the gay and literary scenes of the city. Now I only go there once a year and that is for the Saints and Sinners Literary Festival and I get to see all the places I loved. My friends are gone—part of the generation we lost to AIDS and the city is not what it was before Katrina but I can tell you and William Walker can agree that there is something about New Orleans that stays with one his entire life and it is not just red beans and/or rice or coffee with chicory. Walker has tuned into the fine literary heritage of the city—a city that produced Capote and Williams and Hellman among others and I am going to add Walker to that list. He has captured New Orleans in her nuances and his prose is reminiscent of those who came before him. He had some pretty big shoes to fill and he does so wonderfully. “Desire” is a collection of short stories about gay life in the city and this is a subject that has been surprisingly overlooked. Gay life in New Orleans before the flood was legendary with the sultry climate providing a backdrop for men who like men. Class lines are strict in the city aside from in the gay subculture where you are as likely to meet a grocery store bag boy or a former king of Carnival at Lafitte’s in Exile or the Bourbon Pub. In the gay world of New Orleans, everyone speaks the same language and there is no question as to what is meant by a suggestive line. I remember so well overhearing a native New Orleanian tell a tourist, “Yeah, we had culture but we got rid of it. We’d rather drink”. And that is the atmosphere of the French Quarter where street and bar cruising has not been replaced by internet chat rooms. Walker’s characters are very real and he writes of them from his heart. As they spring to life in his words we grow to love them and I just wish I had more time to spend with Jay, Butler, Jack, Pablo and the rest. I was flooded with memories of the Louisiana Purchase, a seedy hustler bar that is now part of Tom Woods’ enterprise and renamed Good Friends. I walked down Felicity Street again as I read and I remembered every Maynard and Stan I ever knew. With all of the characters in the book there is one that stands high above the others and that is New Orleans, herself. Like the queen that she is, she reigns over her denizens and they pay her the homage and respect she deserves. New Orleans will always survive and just as she does so will the memories of those who have lived and loved there. William Sterling Walker adds to that with is wonderful book of New Orleans stories. He imbues his stories with sophistication that is truly a New Orleans characteristic or as we used to say “trashy elitism”. It is no wonder that the word desire is used to represent the city and while at times that desire might be coupled with regret, I believe that regret only comes when the desire is not fulfilled (if that even makes sense—but it does sound good). It is in the gay community that Walker shows us the lives and the loves of the people and I wonder that if these stories were set anywhere else, would my reaction to them be the same. I doubt it. What I do not doubt is the wonderful reading experiences I had reading this book and while I did not review story by story, I am sure you will be glad that I spoiled nothing for you. This entry was posted in GLBT fiction on October 21, 2012 by Amos.